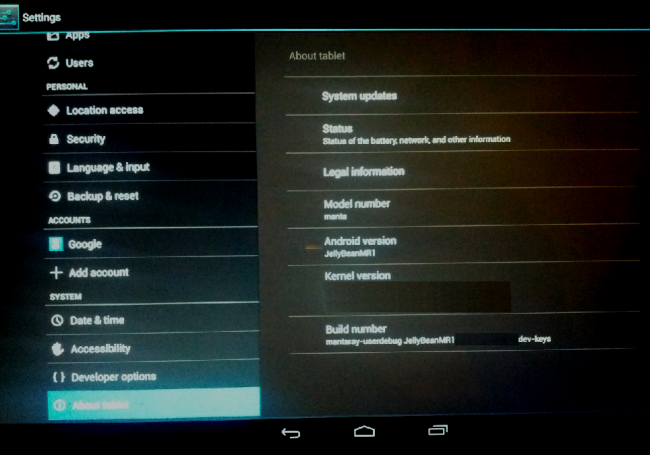 Is This a Picture of the “About” Screen for the Samsung Nexus 10? Confirms Multi-User Support is on the Way? The Samsung Nexus 10 is now the talk of the Android world as we inch closer to Google’s Android event on October 29. We saw Google’s Vic Gundotra post pictures with it to his G+ page this morning, and then a benchmark with specs for the device moments ago. Thanks to a commenter over at Gizmodo, we may have a picture of the device’s “About” screen as well. I’ve held it. It’s a Samsung 10″ tablet that looks exactly like the user manual that leaked. All plastic, very thin, front firing stereo speakers. Running Jelly Bean, not Key Lime Pie. It’s designed to be held in landscape rather than portrait. After admitting to having held it, he was then mocked by another commenter, which prompted his posting of the picture we attached above as some sort of proof. As we all know, About screens can be faked in a heartbeat, so take this however you’d like. He did deem it necessary to cover up parts of the build number and kernel version, so there is at least that to add to the story. We can see that the model number is “manta” and the software build name is “mantaray,” two things that were confirmed from the Nexus 10 in the recently posted benchmark. The device is also running JellyBeanMR1, the same version of Android that the LG Nexus 4 has been spotted running in the past. Last, we should point out the section in the left column under “Apps” that reads “Users.” I don’t know about you, but I’m assuming that means multi-user support is indeed on the way. Hopefully the hurricane on the east coast allows for Monday’s Android event to happen, because we may be in store for more goodies than initially anticipated.